This HBA requires a special SAS cable (530-4088-01) that ships with the card, or that you order separately as an option (X8224A-N). Also refer to the Sun Storage 6 Gb SAS PCIe RAID HBA, Internal Installation Guide for additional details. Install the card in PCIe slot 0. See Install a PCIe2 Card Into the PCIe2 Riser Card. 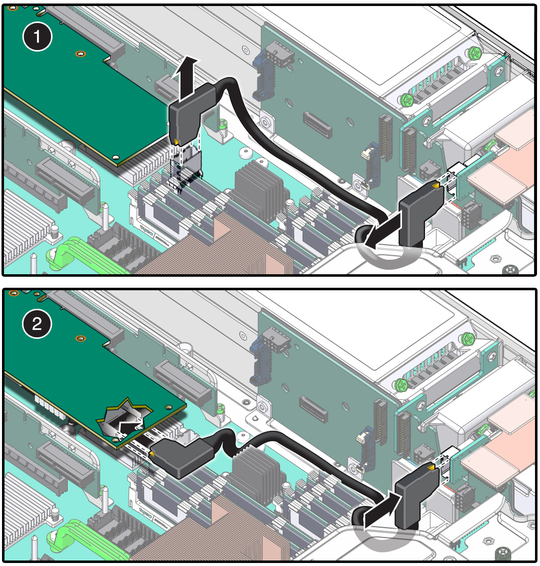 Remove the existing SAS cable connected to the hard drive backplane connector and the motherboard near slot 0 (pane 1). Connect the new SAS cable's PCIe connector to port SAS0 on the HBA (pane 2). Route the SAS cable as shown in the figure and connect the SAS connector to the connector on the hard drive backplane (pane 2).